When I plot data like this, I use colors for one dimension, and symbols for the other. 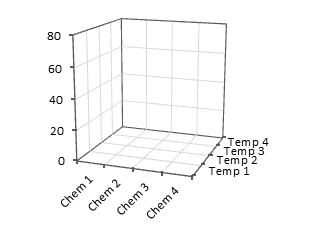 For example, all points for temp1 would be blue as in your first plot, but all chem1 would be squares. This definition would hold for both plots. i am very pleased to see this rutless no holds barred exposure of the Excel 3-D graphing limitations (they are unable to communicate information clearly and simply). i am pretty sure that countless managers across the world who have had to decipher these brainless 3-D graphs in reports and reviews are thanking you for this article. so thank you. In fact, I think you showed great restraint. My questions, how do you politely tell somebody that their chart is not worth the paper it is printed on? 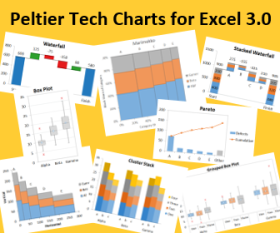 Excel’s got 3D line charts , pie charts (3D or 2D), stacked charts, 3D bar charts, … it is just amazing how many styles they have that never should be allowed to exist. Then again, most people I know can’t comprehend the difference between a “true” x-y plot (aka Scatterplot) and a category plot. Category plots done with lines are just plain wrong. When I see an idea that makes no sense to me, I often try to imagine a world or a perspective in which it could make sense. It’s a good exercise that can help dismissing good ideas too fast. However, no matter how much efforts I put into it, I can’t imagine a scenario where the right chart would be 3D-cones, -pyramids or -cylinders. Out of curiosity Jon, can you think of a situation where this chart would be a good idea? I assume this is just driven by “in 3D it looks cooler”, but maybe in a parallel universe there is a case for these? In most cases, I think the designer’s thought that “3D is a whole D better than 2D”. Even though with this kind of D, less is more. How about, “Excuse me, but your chart is not worth the paper it is printed on”? In general this is true, but I’ll add, “it depends.” If the categories are in some kind of logical order, then a line chart is not necessarily bad. And the Parallel Coordinates chart is a categorical chart with many line series, and it performs well in its role. I agree that the mantra of always avoiding lines for categorical axes can sometimes be overruled, but only if someone properly understands why it matters. In your example, if the difference between chem 1-4 was the addition of a small amount of four different elements to the alloy, then the order is somewhat arbitrary. Even ranking them does not (in my view) justify joining them with lines. If however the difference was a changing proportion of the same element, then there is a natural order and joining them with lines implies the continuum that might be expected for mixtures at intermediate points. Of course, in this case it is arguably better to actually use a quantitative value such as the proportion of the changed element and XY plot it with a quantitative axis rather than purely categorical. On the subject of 3D charts, I do lots of work with Dynamics CRM, and the charts and dashboards in 2011 are a great addition, although somewhat limited in their “out of the box” delivery (but usually in good ways). I am hugely saddened to see the number of people blogging about how to use the chart xml language to customise these charts to “look better” – you guessed it, by adding 3D, gradient fills, rounded edges, and in the worst case I have seen holding up a 3D, lighting-modelled pie chart as being a great example of stunning data visualisation. I also need to try and convince people why a funnel metaphor for a sales forecast is only useful as a metaphor – the huge visual distortion provided by drawing a large triangular area either side of a simple stacked column is ridiculous. The alloys I discussed are a bit complicated. Based on aluminum, they contain varying but not exactly proportional amounts of three transition metals that result in nearly proportional amounts of a second phase precipitate, which provides strengthening in these alloys. I don’t remember exactly, but the alloys had something like 8, 16, 25, and 33 percent by volume of this strengthening phase. We generally left out the microstructural details when presenting this data. The temperatures are nearly proportional as well. In our literature, we used actual temperatures rather than the dummy labels used here. I think we’re fighting an uphill battle against people who think the only justification needed to add an effect is our ability to do so (and especially our ability to hack our way to it). Speaking of funnels, the funnel analogy describes the shape of the plot. But in my kitchen, everything that goes into the top of a funnel comes out the bottom. In a funnel chart, the smaller dimension indicates things that go in but do not come out (prospects lost, sales not consummated, etc.). I dislike this metaphor, especially when people think they have to center the bars, instead of aligning them along one edge. You are definitely correct to say the lines are easier to interpret than columns here, and certainly easier to interpret correctly. My eye is tempted to draw imaginary lines through the tops of the columns, and because of the spread of columns I see a greater or lesser difference between the series depending on which way round they are ranked. If you cover the two side areas, the stacked bar left in the middle is correctly proportioned, in other words it is only the heights (=length) of the bands that matter, so the 2D distortion is bad enough, and 3D is just horrible. As for the analogy, I think the bit usually missed out from the metaphor is that this is not supposed to be a filter used to narrow a flow (to refill a small bottle from a large container, say), but should be thought of as a laboratory *filter* funnel – the filter paper means that only “the good stuff” gets through, and rubbish is kept back. The field layout of Rep 1 would “look” like this, and Rep 2, 3 & 4 would be similar. Everyone thinks their situation is special, and allows them to do what is generally not recommended. Given that your data has an actual planar arrangement for the location of the data, you may almost have a point, not necessarily for a 3D chart, but perhaps for a different kind of chart that allows for plotting a value variable against two positional variables. What is the value you want to plot? Thank you for responding. We’re plotting crop yield as lbs/Ac. The ANOVA can effectively remove variation due to Reps (& Blocks in this design) and the layout reflects the structure needed to do this. However, in this experiment, severe weather may have affected localized areas disproportionately. This sort of variation will not be revealed in the ANOVA. My thought was to create the 3-D layout in Excel in such a way that visually it will help identify small affected areas. (The weather and flooding could not likely affect just a single plot, 1100 sqft.). The yield values typically fall in the range from 1000 to 5000 pounds per acre with some more extreme values. I think a heat map might be a useful way to illustrate your results. I’ve described how to make a heat map using some dummy data based loosely on your description, in Create a Heat Map Using Excel’s Conditional Formatting. IMO, The Naysayers are missing the point of Charts. Charts, other than navigation, are not intended to communicate Data. That’s what Tables are for. Charts are meant to inform of the relations between data in a meaningful way. No Graph can communicate data to any greater precision than about +-3 in the third significant digit under the best of conditions. 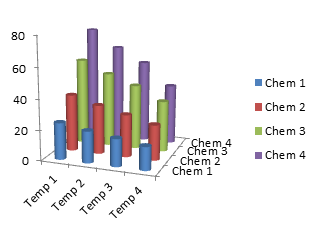 OTOH, looking at all the Charts above, some of the 3D Bar Charts inform me at a glance which things did what in relation to the others, under differing conditions. Then, I looked at the legends to see what was what, what was better or worse, and, what Conditions? Oh, I never did look at the numbers, they are irrelevant to understanding the relationships. Jon is complaining about some factors being in the wrong place in different Bar Charts. 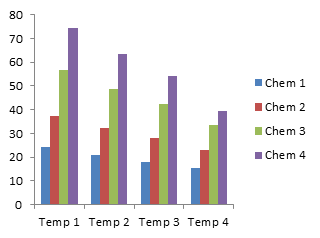 Merely reverse the order of data in one or two columns to change the appearance of the chart. Reversing the order of Data is only a seven line Function in VBA.